The idea of following sound principles is one of the main lessons in The Intelligent Investor. The other, of course, is the cycle of optimism and pessimism in the markets. The sound principles help to avoid mistakes and think independent of the crowd. The cycle is what gets people into trouble. Those basic principles get tossed aside for what appears to be something better. But with markets, there’s always something better. The shiny object syndrome exists around returns. There is always something outperforming, which causes people to pile in, only to watch it lose – literally and figurative – to something else. They used to say about the Bourbons that they forgot nothing and they learned nothing, and I’ll say about the Wall Street people, typically, is that they learn nothing, and they forget everything. I have no confidence whatever in the future behavior of the Wall Street people. I think this business of greed – the excessive hopes and fears and so on – will be with us as long as there will be people. There is a famous passage in Bagehot, the English economist, in which he describes how panics come about. Typically, if people have money, it is available to be lost and they speculate with it and they lose it – that’s how panics are done. I am very cynical about Wall Street. And my guess is that Wall Street hasn’t changed at all. The present optimism is going to be overdone, and the next pessimism will be overdone, and you are back on the Ferris Wheel – whatever you want to call it – Seesaw, Merry-Go-Round. Yes, well now I have lost most of the interest I had in the details of security analysis which I devoted myself to so strenuously for many years. I feel that they are relatively unimportant, which, in a sense has put me opposed to developments in the whole profession. I think we can do it successfully with a few techniques and simple principles and the character to stick to them. Well, I would not deny that. But I have a considerable amount of doubt on the question of how successful analysts can be overall when applying these selectivity approaches. The thing that I have been emphasizing in my own work for the last few years has been the group approach. To try to buy groups of stocks that meet some simple criterion for being undervalued – regardless of the industry and with very little attention to the individual company. My recent article on three simple methods applied to common stocks was published in one of your Seminar Proceedings. I am just finishing a 50-year study – the application of these simple methods to groups of stocks, actually, to all the stocks in the Moody’s Industrial Stock Group. I found the results were very good for 50 years. They certainly did twice as well as the Dow Jones. And so my enthusiasm has been transferred from the selective to the group approach. What I want is an earnings ratio twice as good as the bond interest ratio typically for most years. One can also apply a dividend criterion or an asset value criterion and get good results. My research indicates the best results come from simple earnings criterions. Well, naturally, the thing that I have been talking about so much this afternoon is applying a simple criterion of the value of a security. But what everybody else is trying to do pretty much is pick out the “Xerox” companies, the “3M’s”, because of their long-term futures or to decide that next year the semiconductor industry would be a good industry. These don’t seem to be dependable ways to do it. There are certainly a lot of ways to keep busy. 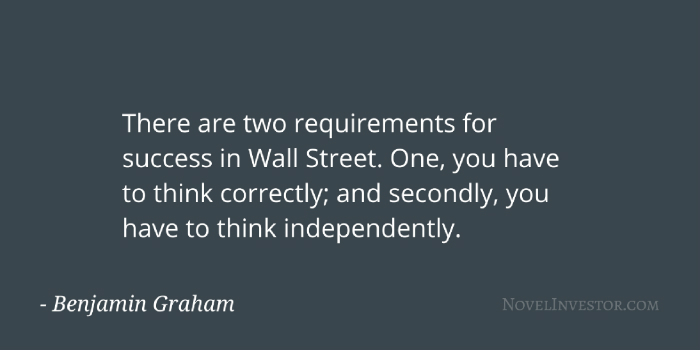 Graham proposes the idea of following a set of rules based on sound criteria that tell you what stocks to buy, how many to buy, and when to sell them, then tops it off with “the character to stick to them”. That last part gets overlooked sometimes. Rules are useless when not followed. Dangerous even. Rules are a way to reinforce your independence from the crowd. Otherwise, you could get lost in that cycle of fear and greed.